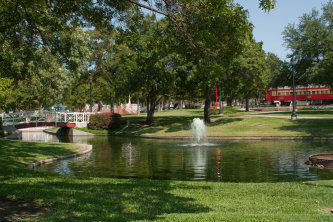 A beautifully-landscaped five and a half acre park in the middle of the downtown area, Haggard Park boasts a playground, a pond, picnic areas, chess boards, and paved walking paths. A picturesque gazebo that can be rented for special events faces onto the pond. Drinking fountains, restrooms, and dog waste stations promote the comfort of all visitors. The gazebo is available for reservation through the parks and recreation reservation system. Please call 972-941-7275, Mon - Fri, 8:00 a.m. - 5:00 p.m. for information or to make a reservation. Reservations are accepted for one of two time slots - 8:00am to 2:00pm OR 3:00pm to 9:00pm. The RESERVATION FEE is $50 for residents ($100 for non-residents) per 6 hour time slot and is non-refundable. A refundable reservation deposit of $75 will also be required. Both fees must be paid at the time of booking.